Indoor Skydiving vs. Outdoor Skydiving in NJ: Which One Is For You? Skydiving indoors.. wait, what? How is it possible? Indoor skydiving is another name for a vertical wind tunnel. Basically, it is a big vertical cylinder with air running through it at high speed. It allows to simulate freefall conditions indoors, without actually jumping out of an airplane. The wind speed is high enough to support the weight of a person and let you ‘float’. 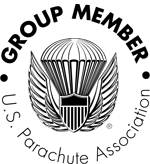 First time flyers can experience freefall-like flight indoors, and skydivers can perfect their freefalling skills in the wind tunnel. The concept is not really new. The wind tunnels have been opening their doors for public all over the country over the last decade. It is a popular attraction since indoor skydiving doesn’t require any advance preparation or licensing, and anyone who's physically fit and healthy can just book their spot and fly! So how does indoor skydiving compare to jumping out of an airplane? Both have their own unique features and experiences. First, an indoor tunnel does not depend on weather. For us skydiving in New Jersey, that’s definitely a factor. You can skydive indoors any time, day or night. To skydive out of an airplane, the winds and the clouds have to cooperate. Second, you can fly a lot longer in an indoor skydiving tunnel. In the sky, you would have about a minute of freefall per jump. In the wind tunnel, you can fly until you get tired (which typically happens in a few minutes, it’s tiring!). Budget is also a factor - tunnels are costly to operate, and the prices range from $25 to $50 per minute, depending on location and the package you book. Does indoor skydiving feel like real skydiving? The short answer is, not really. The experience of stepping out of an airplane at 13,500’ altitude really can not compare to anything else in the world. Close your eyes and imagine it: You’re high above the ground, the view is beautiful and the sunny sky is peaceful. Then a door opens, the wind takes your breath away and you’re standing on the edge by the door. Take a step outside into the sky, and fly free! The view, the sky, the adrenaline rush of that very first step, and the feeling of being on top of the world are what sets real skydiving apart. Another experience that you can only have in the sky is the canopy flight. Your instructor steers the canopy, gliding in crisp air at 5000’ above the ground, slowly making your way down. The flight takes about 5 minutes. It feels quiet and peaceful, and you can take your time to enjoy the view, or practice steering the canopy by yourself. Just ask anyone who has done it, see their eyes light up, and you'll want to try it for yourself! Try both for yourself and let us know which one you prefer, and which moments took your breath away! To fly in a tunnel, the closest locations to us are iFLY Paramus in NJ and iFLY King of Prussia in PA. And for a tandem jump out of an airplane, come to Skydive Cross Keys! We’re open year round and we’d be thrilled to introduce you to real skydiving.